Learn how to exploit the power of Samba's ancillary utilities. In the first part of this article, I introduced you to Samba, the open-source software suite that makes it possible to transparently share files on a network composed of both Windows and *NIX clients using the Server Message Block (SMB) protocol. I showed you to how to install and configure Samba, and also demonstrated the most common examples of its usage in a small- or medium-sized office network. In this concluding part, I'll be spending some time on the ancillary utilities that are included with the Samba package, showing you how they can be used to connect to other SMB clients, mount SMB file systems, perform backups of user data, and manage common administrative tasks using a Web-based tool. All that and more, inside - so keep reading! In case you're working in an environment that is sensitive to file names, you can use Samba's "name mangling" capabilities to impose a particular set of rules on the filenames it creates. Consider the following addition to the "smb.conf" file, which ensures that the name of every file created on the Samba server is upper-cased. Over here, the "default case" attribute sets the default case for new filenames, while the "preserve case" attribute controls whether filenames are preserved as is, or if they are forcefully changed to a different case. If your server implements disk quotas for users or groups, you can have Samba respect these quotas as well; simply recompile it and, this time, add the "with-quotas" argument to the "configure" script. Once you've got a new Samba binary built and installed, you should find that the system automatically restricts you from using more than your allotted disk space. As you can see, Samba returns a "disk full" error as soon as the group exceeds its allotted quota. You're already familiar with the "smbclient" utility - I used it when first configuring and testing Samba. But "smbclient" can do a lot more than just verify that your Samba installation is working as advertised - it's actually a full-featured FTP-like SMB client that can be used to perform file transfer and manipulation operations with an SMB server. You can start up "smbclient" by providing it with a host name and share name to access. at the command prompt, or a one-line description of each command by typing "help" followed by the command name. 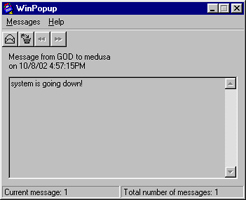 When this message is sent to the Windows workstation named "medusa", it pops up as a dialog box on that machine (note that in order for this to work, WinPopup must be installed on the target system, and must be configured to accept and display messages). Thus far, you've been sharing directories on the server with Windows clients through Samba. But here's a twist - what if you want to mount a shared directory on another workstation on the server? and then use the "mount" command (which internally calls "smbmount") to mount the share using standard SMB syntax. Connecting clients will now be able to see the "music" directory on machine "clubhouse" as a share named "music" on the "olympus" Samba server. This is a roundabout way of doing things, but it's an interesting experiment nevertheless, and it serves to demonstrate how easy Samba makes it to create links between different systems and machines. In this case, the "smbtar" utility creates a TAR archive of the files located at the share "//clubhouse/music", and stores the result in a file named "tar.out". By default, the "smbtar" utility looks for a share named "backup" on the specified SMB server. This makes it easy to schedule regular backups of Windows workstations in an office environment - simply ask each user to create a share named "backup" on their individual workstations containing the files they'd like to have archived, and run a script on the server at regular intervals (via cron) to connect to each workstation, look for a share named "backup", and - if it exists - archive its contents to a TAR file. If you're the kind of person who finds it hard to deal with text files, Samba comes with a graphical, browser-based interface that helps you configure the software without resorting to manually editing configuration files. This tool, affectionately known as SWAT (Samba Web Administration Tool), provides an easy-to-use graphical interface to the numerous configuration directives available in the "smb.conf" file. where "olympus" is the name of the server Samba has been installed on. You can now use the point-and-click interface to set up, edit and remove shares; define privilege levels and permissions; control name mangling and perform other common tasks. SWAT also includes context-sensitive help for each configuration option available in Samba, so that you have an easy way to refer to the meanings of the various directives. It's quick, reliable and relatively pain-free...and infinitely simpler than using Vi! Over the course of this two-part article, I've taught you a little bit about Samba, and showed you how you can use it for seamless file sharing between *NIX and Windows systems. I also spent a little time on the ancillary tools that ship with Samba, demonstrating how they can be used to accomplish common tasks like file backup, point-and-click configuration and SMB share manipulation. Or - if you're really curious - drop me a line and tell me what you'd like to read about. Until then...ciao! Note: All examples in this article have been tested on Linux/i586 with Samba 2.2.5 and Windows 98. Examples are illustrative only, and are not meant for a production environment. Melonfire provides no warranties or support for the source code described in this article. YMMV! This article was first published on 11 Oct 2002.